Click here for audio of Episode 1282. Today, we learn to make window panes. The University of Houston's College of Engineering presents this series about the machines that make our civilization run, and the people whose ingenuity created them. We've made glass in many forms for about 4500 years. But two features of glassmaking are surprising. First, glassmaking processes have been far harder to invent than we imagine. The second surprise is that artisans could make really fine glass tableware long before they could make a good windowpane. 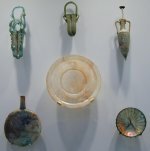 The ancient Egyptians and Greeks made crude glass decorations. But today's basic soda-lime glass -- made of sand, limestone, and sodium carbonate -- is far more recent. The first glass of any real quality was made in Hellenistic North Africa around 300 BC. Soda-lime glass came quickly on its heels. Both Hellenistic artisans and the Romans who followed them made fine glass tableware. Tableware remained the most common glass product for a long time. 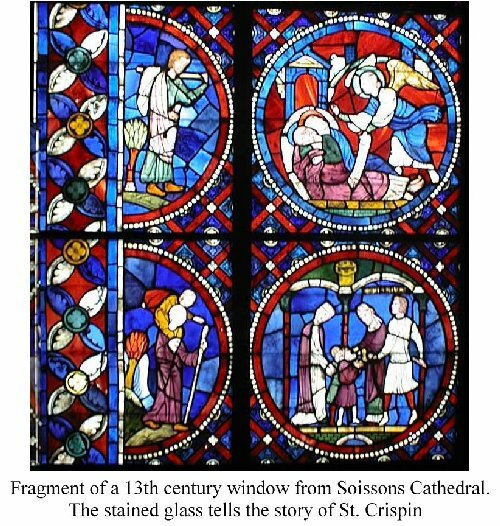 The stained glass art of the Gothic cathedral was so highly developed that we might think glass handling had reached high perfection at that point. Actually, what had reached a perfection that seems to be beyond our reach today was coloring the glass. A medieval window admitted light, but it was seldom smooth enough to provide a clear view. Cathedral windows did not even try to offer any view of the outside world. What they did so beautifully was to offer illuminated bible stories to the faithful who, for the most part, didn't read. Medieval glassblowers made two kinds of flat glass sheets. One technique was to blow a large cylinder. They then cut the cylinder open and flattened it out while it was still hot. The other flat glass sheet was called crown glass. They made it by spinning molten glass and letting centrifugal forces spread it from a central point. 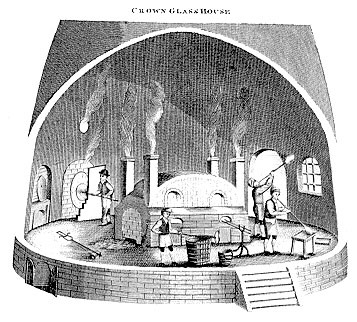 Crown glass was the most common flat glass for a long time. It underwent considerable refinement. But, even as late as 1800, most domestic windows still displayed a characteristic umbilical imperfection called a crown at their centers. The French developed the superior plate glass process in the latter 18th century. First a plate glass is poured out in a mold. Then the glass needs expensive grinding and polishing. To provide common people -- you and me -- with good domestic windowpanes required a continuous mechanized process. Molten glass had to be rolled out in smooth continuous sheets. That couldn't be done until we had modern process machinery. It was in the early 1800s that the first inexpensive rolled window glass became available. That was little over a century and a half ago. The lowly windowpane reminds us how we take yesterday's great acts of inventive genius for granted. Windowpanes are the result of terribly complex high-temperature chemical and mechanical processes. Yet few things give our daily lives the soul-settling grace of these unobtrusive bridges to the outer world -- this technology which is at its best when it is completely invisible. You'll find one of the best accounts of the history of glass and glass-making in the 1911 Encyclopaedia Britannica . This episode is a revised version of Episode 38.